YOU. GUYS. I have the greatest post for you today! But first, some back story. When I signed up to participate in Utah Book Month, one of the things I agreed to do was to host an author interview. A few weeks later I had the great pleasure of interviewing the one and only Jennifer A. Nielsen, fellow Utah native and New York Times Bestselling author of The Ascendance Trilogy, Infinity Ring, and Underworld Chronicles. Cue major squealing and hand flapping. I don't know about you, but in my head I envision authors as these sage, mythical beings, much like unicorns or sphinxes, who occasionally bless the rest of us muggles with their wisdom, creativity, and insight in the form of books. (Authors, you are welcome to try and prove your status as regular human beings, but until I obtain verifiable evidence to the contrary I'm going with my mythical creature theory.) So when I first contacted Ms. Nielsen to arrange the interview I was a ball of jittery nerves. What if she thinks my questions are dumb? What if she changes her mind about the interview? WHAT IF I SPELL SOMETHING WRONG?!?? Luckily for my nerves, Jennifer was gracious and friendly, responding quickly and kindly and giving the best answers to my questions. I was so happy to learn that she also loves dark chocolate and Jane Austen, and, seriously you guys, the projects she is currently working on sound rad. I've already added Mark of the Thief and A Night Divided to my Goodreads to-read list, and you should too. But enough of my blabbering. On to the interview. Take it away, Jennifer! Hee-hee. Right now, this is one of those questions where it feels like I should answer what aren’t I working on? 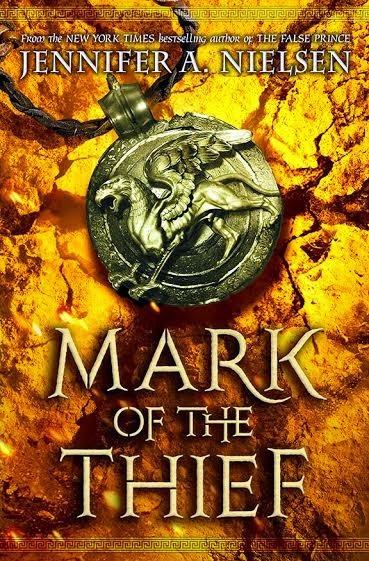 In February, I will release a new series, MARK OF THE THIEF, which takes place in Ancient Rome with an escaped slave, some stolen magic, and a battle to control the fall of an empire. I’m so excited for this release but there’s also a ton of promotional stuff to be done to get ready. I’m also writing the second book in that series, and am on chapter um...well, let’s just say I really need to pick up the pace! I’m also in the middle of edits for another historical book I’ll release in fall 2015 called A NIGHT DIVIDED, which tells the story of a girl in Cold War East Germany who wants to escape the Berlin Wall to reunite her family. I love this book! And then I’m beginning research for the book to follow that one. Can’t say much about it yet, but I can’t wait to start talking about it! Sheesh, no wonder I’m tired. 2. Describe your ideal writing situation in three words. 3. Put these in order from most to least favorite: outlining, writing, revising. For me, outlining is the hardest part of writing. I’m not always good at envisioning how the story will come together and my outline changes so often during the actual writing that I sometimes wonder if I’m writing the same story that I just outlined. That said, the better my outline, the easier my writing, so it’s definitely an important part of the overall process. And my favorite is the revision process, which is when the words become art. My first draft gets written pretty quickly, but I spend a lot of time rewriting, and rewriting. And rewriting. 4. What's your favorite thing about living in Utah? As a writer, I find Utah to be an inspirational place to find story. A lot of the settings of my books are inspired by places in the state that I love, even if it doesn't appear that way as you’re reading.But beyond that, I think Utah is a wonderful place to raise a family. 5. What fictional world would you like to live in? I could totally lose myself in Jane Austen’s world. Whenever I re-read her books, I find myself wishing I could walk inside the pages. That’s not a feeling I often experience as a reader, but I always do with her stories. By the way, if Colin Firth could walk into the pages at the same time, that’d be bonus! 6. If you weren't writing books, what would you do for a living? I’m a mom and always put that first, but if I weren’t writing, I would open a theater in my community to put on shows and teach lessons there. I love the theater and every time I see a show, I am shocked by how much I miss being on stage. But writing seems to fill that same love, so I’m incredibly lucky to have a job that fits me so perfectly. 7. What is one of your writing goals? I think of writing goals as compared to climbing a mountain. While you’re writing your first manuscript, you look up to the summit. Reaching it means you’ve completed your story and that’s fantastic when you get there, but it also means that now you can see another summit, even higher, which is publishing it. And once you get there, you realize that there are other goals still to be obtained. We are all climbing, all of us, and it doesn’t matter where we are on the summit, as much as that we’re all gaining altitude. Even before I was published, I had three goals: One was to make the NYT Bestseller list. The second was to have a movie studio adapt my work and turn it into a movie. And the third was to see someone in public with whom I had no connection, reading my book. The first is checked off the list. The second is…well, we’ll see at the end of February 2015 when Paramount makes their decision on THE FALSE PRINCE. But the third has yet to happen. Friends of mine have seen other people in public reading my book, but I have not. There are other goals I’ve added since then, but that last elusive pre-publication goal is still nagging at me. 8. What objects are currently sitting on your writing desk? To my left are some of the writing awards my books have won and a small piece of the Berlin Wall, a recent birthday gift from the hubby. Straight ahead is a jar that used to hold pens, until my kids discovered that’s where all the best pens in the house were kept and looted it. To the right is a stack of foreign FALSE PRINCE books that I sometimes bring along when I’m talking to kids. They don’t belong there, but I haven’t put them away yet (and probably never will, if I’m being honest). Beneath my computer is an assortment of papers for research. Inside the desk is a bag of Starburst. I can’t imagine how my kids have not yet discovered it, but it’s only a matter of time. I’d better enjoy them while there’s some left! 9. Are there any occupational hazards to being a writer? Well um, I have been assaulted by fans, but only twice. Or three times, depending on how we’re defining assault. ;-) But I heard a great description the other day that I think all writers will identify with: Writing is like being on call to your brain 24/7. This is definitely an occupational hazard – never fully getting away from story. Most writers I know will describe their tales of waking up in the middle of the night with just the right ending, or from a dream that they can’t shake from their imagination, or of pulling over on the side of the road to write down the dialogue that popped in their head. When the story calls, life gets set aside, and that’s just part of the process. 10. What is your most and least favorite part of the writing/publishing process? My least favorite part of the process is the waiting. So much of publishing involves waiting: for the agent or editor to respond to a query, for the acquisition meeting, for editorial notes, for the book’s release…everything. I’m more used to it now, though I’ve also decided that I’m not the most patient person. And who wants patience as a virtue anyway, right? You know how the saying goes: Good things come to those who….well, whatever. I’m still not a patient person. My favorite part is when the story’s key moment comes together in the perfect way. Sometimes writing is like putting together a jigsaw puzzle. You fit pieces together with only a vague idea of how the finished picture will be and become excited as that picture starts to emerge. But there’s always one part of the puzzle where nothing seems to fit and every piece you try is the wrong one. And then there’s a moment where you pick up a piece and you know it’s going to fit and that it’s the key to the rest of the puzzle making sense. For me, finding that piece is the same feeling as when I know I’ve just figured out the scene that will bring the entire story together. 11. What advice do you have for aspiring writers? When I talked earlier about summits and writing goals, I think this made all the difference for my career. When I told people I wanted to become a NYT Bestselling author, they sometimes laughed and suggested I try to become any published author first. Fair enough, but knowing where I wanted to go laid out a path for the summit I wanted to climb and kept me focused on it. In publishing today, there are so many options for a writer, and an infinite number of ways to define success, which is a great thing, but it’s also easy to get distracted and accept less than what you really want. So wherever you are in the publishing process, I’d encourage an aspiring writer to step back and decide where you want to go. Because each decision places you on a different path in terms of where you’ll eventually end up. And the better your focus, the greater your chances of success! I also believe in dreaming big. You’ll never achieve higher than your biggest dream, so go for the craziest, boldest, awesomest dream you can imagine, and then figure out how to make it happen. Thank you so much, Jennifer! Isn't she awesome? This is so cool! Adding her stuff to my to-read list, sounds like fun. Thanks! I was so delighted to interview her, and am so excited about her upcoming books. They sound so good! Thanks! It was a fun interview. A Night Divided really does sound so, so good, doesn't it? I'm looking forward to it! Thanks for your comment, it was really fun to interview her! I totally agree, it's inspirational to think she set such high goals and achieved them! Definitely check out The False Prince. It's got one heck of a twist that will change the whole way you see the book. Great interview! Inventive questions and great answers! Jennifer is one of my favorite Utah Authors! !